People can be hopelessly optimistic, but are perhaps increasingly fairly cynical, about Parliament and politicians. However, things could be a lot worse – and of course there’s nothing new about incompetent, or even dodgy, politicians. In 18th and early 19th century Britain, Parliament was particularly corrupt and unrepresentative. The franchise was based on a variety of (sometimes obscure) property qualifications, which meant that most people could not vote, and some constituencies – known as ‘rotten boroughs’ – had very few voters living in them anyway. Most famously, Old Sarum in Wiltshire had no resident voters at all, but still managed to return two Members of Parliament to Westminster because the landowner controlled the votes of absent tenants. ‘Pocket boroughs’ were constituencies that were in the effective ‘pocket’ of a local landowner and whose Member of Parliament did as he was told. In contrast, the growing urban areas of Britain – such as Leeds – had no representation whatsoever. Parliamentary seats could actually be bought: imagine – that would be almost like a large organisation – a business, or trades union, for example – pumping money into a political party in return for its interests being represented…it’s unthinkable. In the early 19th century, the topic of parliamentary reform was in the air, talked about in the streets and in newspapers like the Manchester Guardian and the Scotsman. Championed by radicals, such as Henry Hunt and journalist William Cobbett, many actually saw reform as just a matter of time, though die-hard conservatives resisted due to a combination of vested interest and fear of mob rule. Into office in 1830 came a Whig government, headed by a 66-year-old aristocrat, Earl Grey, committed to reform. The Tory party was split between the intransigent ‘ultras’ and the more modern reformers. A reform bill was introduced by liberal Lord John Russell: it would remove rotten boroughs, modestly extend the franchise from 366,000 to 650,000 and ensure that the great industrial cities of Leeds, Birmingham and Manchester were represented in parliament for the first time. The bill was narrowly defeated by the ultra Tories. Grey resigned and called a single-issue election. 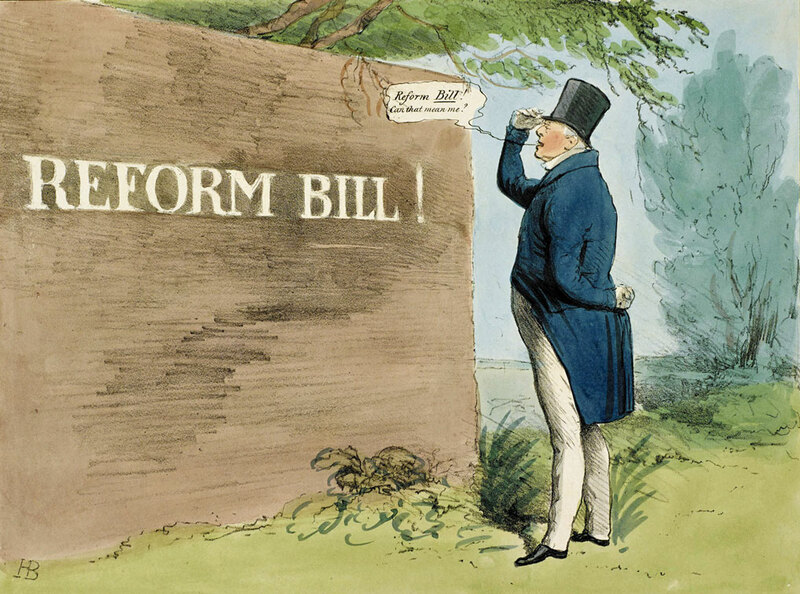 In 1831, the bill was reintroduced; it passed in the Commons but was rejected by the Lords. Riots broke out in London, Birmingham, Derby, Nottingham, Leicester, Yeovil, Sherborne, Exeter and Bristol. Rumours swept the land; would violent revolution come to Britain, after all, just as it had in France a generation earlier? When the bill was rejected for a second time by the Lords, Grey demanded that the King, William IV, create enough peers to see it through. The King refused; Grey resigned (again); the King asked the Tory Duke of Wellington, hero and victor of Waterloo, to form a government; but the Iron Duke knew he could not and advised the King to give in. Faced with the prospect of unwanted reformist peers, the Lords submitted to the inevitable and the great Reform Act became law on 7 June 1832. This was a truly historic moment in Britain’s story; its political elite had taken a significant step toward redistributing power. Yet, despite all the fuss, the 1832 Reform Act effectively enfranchised less than 5% of the population. There was still a property qualification of £10 – a hideously large amount of money for most people in those days – and, of course, women could not vote at all; so the vast majority were still disenfranchised. Even so, Pandora’s Box had been opened. The campaign for universal male (and sometimes female) suffrage gathered pace through the 1840s – notably led by the ‘Chartists’ (supporters of the People’s Charter, drawn up in 1838). 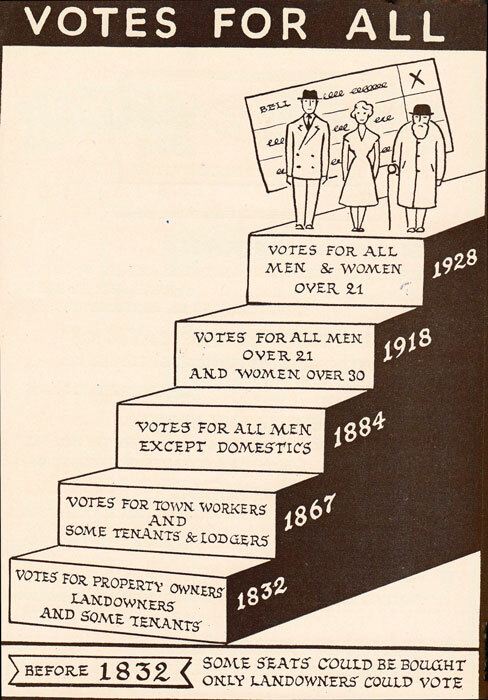 The 2nd Reform act of 1867 enfranchised all male householders – roughly doubling the electorate from one to two million men – and after the 3rd Reform Act in 1884 it is reckoned that more than 50% of British men had the vote. Meanwhile, the Ballot Act of 1872 introduced the essential democratic element of the secret ballot. It was still all about property, though, and it was 1918 before the Representation of the People Act removed all financial constraints and gave the vote to every man over the age of 21 with a residence. Finally, women were enfranchised at the same time – but only those over 30. By 1928, though, it was recognised that younger women could be just as daft as everyone else and universal suffrage for everyone over the age of 21 (with the usual exceptions, such as the insane, convicted criminals and the monarch) was eventually won. Many westernised countries followed a similarly sluggish pattern, though the German Empire granted universal male suffrage as early as 1871. New Zealand was actually the first country in the world to allow women the vote in 1893 (though some had it on the Isle of Man as early as 1881); in contrast, women in France had to wait until 1944 before they got the vote. In 1969, the voting age in Britain was reduced to 18.